Three Burly Men are fishing at sea, when a bottle is caught inside their fishing net. When they pull the cork of the bottle, a map falls into their hands. However, the map is blank and after asking around the local town, nobody can answer the riddle of a blank map. They do hint at possible adventures at sea. In my first adventure with the Burly Men at Sea, my party of salty sailors were swallowed in a single gulp by a whale in a scene pulled from wooden puppets and talking crickets. Within the belly of the beast, I stumbled across some sirens who spoke in a religious fervour of the whale. To them, he was a being who ferried them around physically and spiritually. Tickling the throat of the creature, the Burly Men were launched from the blowhole where they carried on with their adventure. In the second adventure, I explored the stomach of the whale a little more, finding three wooden barrels. The sailors popped them over their heads, like a life-jacket, meaning when they tickled the throat again, they would be blasted into the air once more, but would float upon the ocean. This time they bobbed along with the waves until a shrouded figure paddled towards them. Here was the ferryman and he challenged the crew to a race; if he lost they could travel on, if he won he would ferry their souls to the afterlife. Each adventure ends in a conversation with a water creature made from swirling lines. She informs us that there are more people to meet and more adventures to be had. Suddenly, we’re back on land and walking towards a hut. As we enter, the building is the coffee shop of the local town and the owner reads our mystical map, cataloguing the journey for the collection he has in the store. He has had these adventures previously and he wants to collect more, by asking the sailors to head back out to sea to discover more wonders. The controls for Burly Men at Sea are subtle and a little vague. Brought to the Switch from App stores, it’s easiest to use the touchscreen. Slowly dragging your finger back and forth will guide the sailors to the left or right; tapping random things in the scene will result in either an interaction such as a conversation or a musing from one of the sailors. It may just make a bird fly away or a moose will groan, echoed by the woods in which it stands. The vague controls, which can be switched to the gyroscope should you want to tilt rather than swipe, can be a little frustrating at first, but soon become second nature. The mechanic forces exploration, it forces the player to experience things by poking, prodding and looking around. With such a simplistic art style, the sound becomes incredibly important. Playing with headphones is ideal, because the small noises that squeak, chirp or roar all add massively to the ambience created on the screen. Lines can be made from dots, solid colours fade and swirl and the vector-based art comes to life but it does so as subtly as the movement. 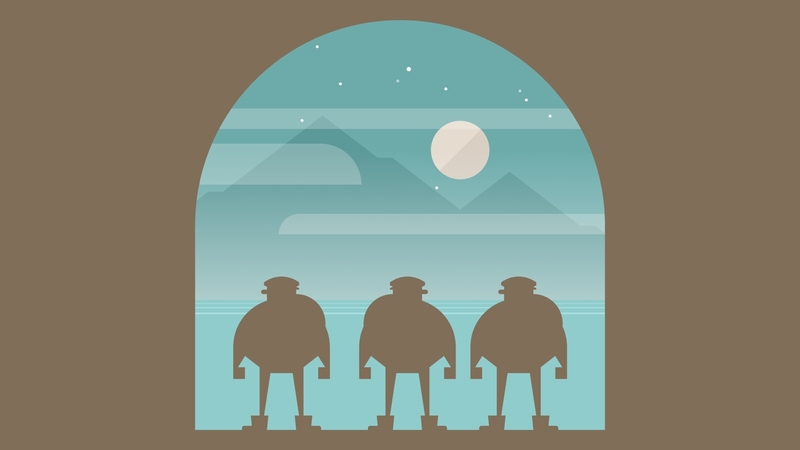 Burly Men at Sea is very dreamlike, with a narrative being drip fed slowly, building a world that is sumptuous and delightful. The characters you’ll meet are lacking in detail visually, but fully formed in personality. I feel like I’m misleading readers by using the word ‘game’ or ‘play’, because really, this is closer to a visual novel or a comic book in motion. I created bonds with those on the screen, I laughed, I gasped in shock and I missed the sense of the game when I wasn’t within the world. Burly Men at Sea is very much a folktale exploration of the world and relationships that surround us.